In an alleyway in Los Angeles, an old man, clutching faded newspaper clippings and gasping his last words to a cop, lies dying of a gunshot wound. The victim claims to be P.I. Elvis Cole’s long-lost father—a stranger who has always haunted his son. As a teenager, Cole searched desperately for his father. As a man, he faces the frightening possibility that this murder victim was himself a killer. Caught in limbo between a broken love affair and way too much publicity over his last case, Cole at first resists getting involved with this new case. Then it consumes him. Now a stranger’s terrifying secrets—and a hunt for his killer—give Cole a frightening glimpse into his own past. 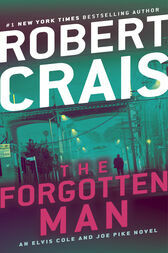 And he can’t tell if it’s forgiveness or a bullet that’s coming next. . . .
Robert Crais is the author of many New York Times bestsellers, most recently The Wanted and The Promise. He lives in Los Angeles.